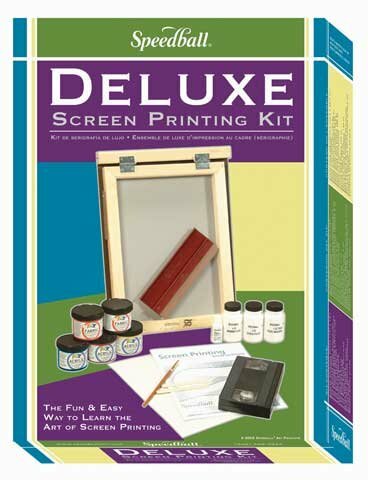 Speedball Screen Printing Deluxe Kit: This kit includes project sheets for making posters decorations wood plaques cards wrapping paper T-shirts aprons hats tote bags and pot holders. It contains textile inks and permanent acrylics as well as an instructional video on screen printing. Tools included are a 9 squeegee frame with fabric base tracing vellum and 4 oz. each of screen filler and drawing fluid. The kit also includes 4 oz. each of process cyan process magenta and process yellow acrylic colors; 4 oz. each of black and red textile ink; 4 oz. of Diazo Photo Emulsion and 1/2 gram of Diazo Sensitizer. Instructions included.